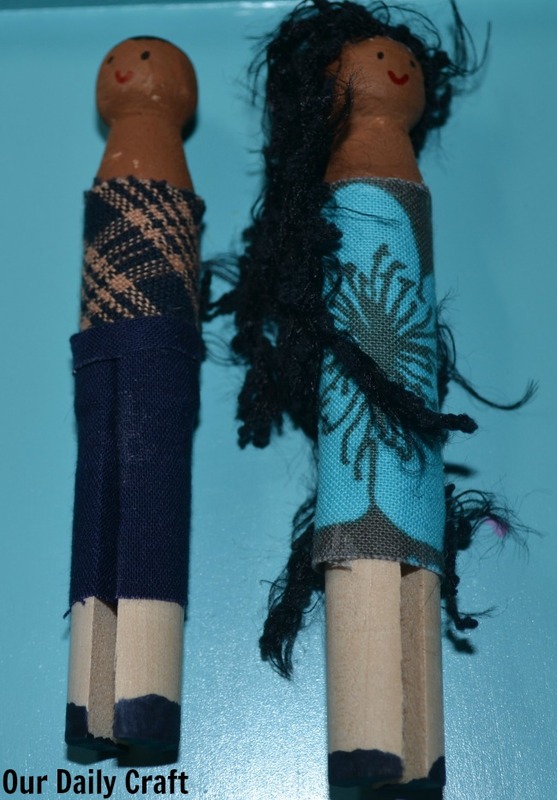 I had every intention of making the girl some peg dolls for Christmas. I actually started them, getting so far as painting the heads, drawing on faces and making/painting hair onto them. Over the weekend she was working on a project at my desk (my resolution for the month is to clear off my desk every day) so I decided to work on the clothes. They just needed little scraps, and the girl approved all my choices. 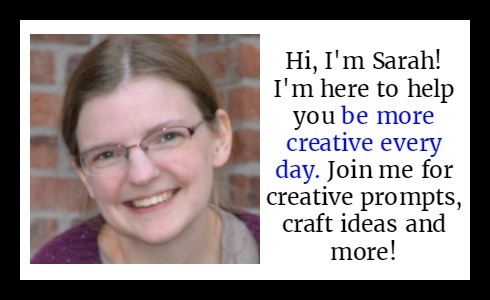 The yarn belt on the blonde one was her idea, for example. The whole set of dolls. I made two boys and three girls (though there’s another girl somewhere that I think she carried off before I got a chance to dress it) and the girl said they needed shoes, too. The girl’s prince and princess. She painted the shoes on her favorite dolls (she says the yellow-haired one is her) and I did the others. One still doesn’t have shoes, which is fine. I love this one’s hair. Having fun yarn on hand is a big plus for this project. This project was a lot of fun and I’m glad the girl got to be somewhat involved even if she isn’t quite ready to do the making herself. For those with older kids, you could both work on the dolls. I hope now that they’re finished she’ll have fun playing with them, too. 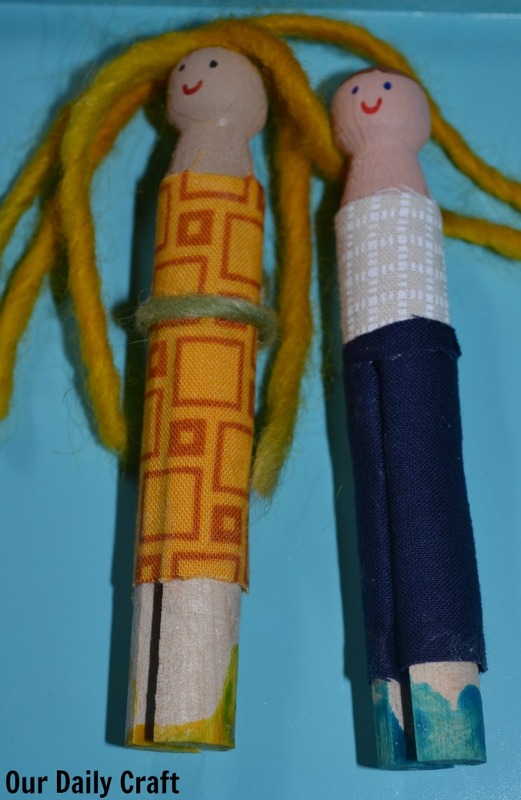 If you want to know more about how to make these little dolls, I learned from a Creativebug workshop. It’s a really great little class that’s just 35 minutes long (and $9.99) and shows you how to make the peg dolls and a felt carrying case. 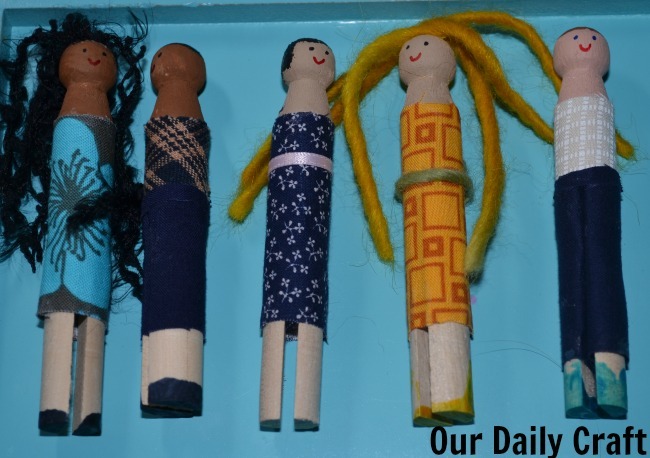 Have you ever made peg dolls? Did your kids play with them? I’d love to hear about it and how you use them.